Toronto Dogs Directory: Things That Make Me Go Grrrrr.....Being Threatened By "Viktor Larkhill", Founder Of "Let's Adopt! 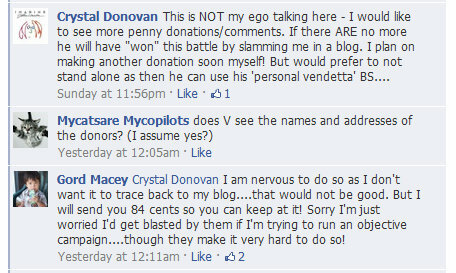 Global"
Things That Make Me Go Grrrrr.....Being Threatened By "Viktor Larkhill", Founder Of "Let's Adopt! Global"
Is "Let's Adopt Global" A Fraudulent Organization? The above two articles have over 600 recommendations combined, something that rarely happens on my little blog. It sure feels like I'm onto something, and now Let's Adopt Global has responded the way they always do when there are detractors. They threaten. They bully. In the latest blog written by Viktor he states, "We also find a Toronto-based blog writer, Gordon Macey, publisher of the Toronto Pet Daily, someone whose reputation as serious journalist could go down the toilet if people knew his “other side"." I thank Viktor for referring to me as a "serious journalist", it's about time someone realized it! While you're reading Viktor's latest article be sure to scroll the others. You won't see them all as a few are password protected, in an act of full transparency by Let's Adopt Global, but on the ones you can see, after reading ask yourself if you can name ONE founder of any reputable rescue group in the world who seems to spend more time degrading people than saving animals. Oh how I wish Viktor had published so many more posts from our private group. The ones about phone calls threatening to burn down one member's house would have fit in perfectly. How did Viktor find out about the secret Facebook group? I assume through the regular Let's Adopt Global method of hacking, as almost all 11 of us has had our accounts compromised in the last month. So there you have it. I am a conniving, duplicitous man who has been taking part in a giant conspiracy to bring down Let's Adopt Global". Truth be told I didn't start out like that. I promise! I became such a horrible person after seeing time and time again the way Let's Adopt Global responds to critics. 4. Why does Viktor spend so much time publishing articles on his blog that aim to degrade individuals (I'm now "famous"....see update below)? Why did he feel it necessary to publish a picture of one individual's underage daughter on the page? 5. Should I be afraid of Viktor and Let's Adopt Global, as so many are? 8. Where is Vania, the dog that Viktor maintains is with him in Turkey. Vania's donations came to more than $10 000. Well.....consider me threatened. With regard to the secret Facbook group? I have nothing but the utmost admiration and respect for the other individuals in it. They have all been bullied and threatened beyond belief by Viktor and Let's Adopt Global. Some are understandably scared of being on the receiving end of even more death threats, yet they continue to discuss and compare notes on Let's Adopt Global based solely on what they have WITNESSED, not through compromising anyone's security. They do so not for fame or personal vendetta (in an ironic twist Viktor's alias is taken from the graphic literature "V for Vendetta"), if they wanted to do that they would each start a blog attacking Viktor in the same way he has done to them. I think you know who they do it for. As far as I can guess the private Facebook group continues to be compromised by Let's Adopt Global. Since Viktor seems to want everything out in the open, a Facebook page "Let's Adopt Global - Their Own Words" has now been published. On it you will see full screen shots from the private group, as well as correspondence from Viktor himself in which he degrades others. If you don't have any reason to question Let's Adopt! Global after viewing the page, then keep forking over your hard earned money. Viktor has some wonderful things to say about me today. Truth be told I wrote the above yesterday but decided not to publish any more on LAG as per my email correspondence with Viktor (somehow I just knew he'd eventually put aside time from "rescuing" animals to call me names & publish pictures). I told him that correspondence would remain private and respected that. In fact, I urge Viktor to go through his 500 pages of hacked material to find where I discussed our correspondence in the private Facebook group. It does not exist. I said I wouldn't publish anything until talking to them first, but I guess Viktor has replied through his blog. I have no problem with my above statement, as I was trying to appear objective to Let's Adopt! Global, not my readers. My readers are adults and can read what I post and decide for themselves if I raise legitimate questions with regard to Let's Adopt Global. I wasn't trying to "dupe" any readers, I was trying to "dupe" Let's Adopt Global, and got caught in the act of doing so (now I know how a CIA operative must feel after a failed mission). Oops! That's ok, they still have to answer the above questions. Not for my benefit, but for the animals. As I stated in the above hacked correspondence, they make it very hard to remain objective. I've questioned Viktor and Let's Adopt! Global as it PERTAINS TO ANIMALS. I refuse to use this blog to encourage others to insult him. I will not post pictures of his family (as he has done to me and others). Might I make the odd comment in a private Facebook group among others who have received death threats? I might and I may have. Have you ever made a comment in what you believed to be a private forum? Can you imagine what Viktor says about others in private? If his public blog is any indication I doubt he's had many flattering things to say about me in private! Don't worry Viktor it is not in my nature to hack into your system. I have the time as I don't portray myself as a rescuer, but you do so I'm confused. Are you a rescuer or a blogger? Which do you spend more time on? Saving animals' lives or attempting to destroy peoples'? As always feel free to read my bio. I may not amass thousands in donations like Lets Adopt! Global does, but I use my ad revenue and personal income to create an equal balance of supporting myself and donating to charity. Oh, and I have every receipt to show for it. Viktor has hacked the private group and has now begun editing our posts so he can publish them to his own pages. Again, unconscionable and unbecoming of ANY rescue in the world. The page is gone now, though anything that Viktor posts must be questioned. To close this matter from my end, I'll direct anyone who wishes to sing the praises of Let's Adopt Global to do so on their pages. I will not publish any such praises. From anyone. That would amount to supporting a corrupt, volatile, and fraudulent organization. It is a shame in that in three years NEVER have I felt the need to close comments, as everyone deserves a say, but when that "say" is nothing more wishing people stricken with cancer would just die, when that "say" is threatening to burn down one's house, and when that "say" is attacking my weight or the fact that I am an amputee it has to stop. Not because I'm hurt by any such comments (I have thick skin, as Viktor's supporters have alluded to time and time again! ), rather because I can not think of one reasonable way that such action helps animals in need. If you are a supporter of Let's Adopt Global and see no harm in the way the organization threatens, hacks, insults, steals, and focuses more energy on doing so rather than actually helping animals, I wish you luck.